Bring a large pot of water to boil, and add the chard. Boil for about three minutes, and drain and coarsely slice once cooled. Wipe out the pot, and then heat the olive oil over medium-high heat. 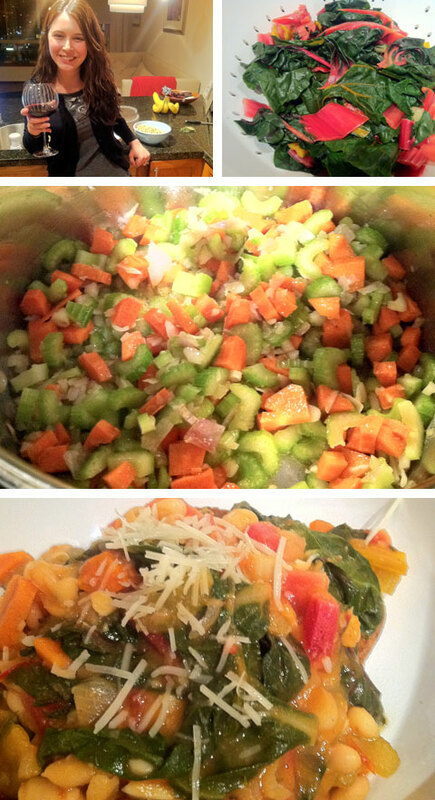 Add shallots, garlic, carrots and celery and saute until tender and slightly browned, 15 - 20 minutes. Add wine, and cook until slightly reduced, about 7 minutes. Add beans, broth, tomatoes, thyme, bay leaf, and salt and pepper and bring to a boil. Reduce heat to medium-low and simmer for about 20 minutes. Add chard and cook for about 5 more minutes, then remove bay leaf and thyme and add more salt and pepper to taste. Toast the bread and spread with roasted garlic. Ladle stew over top, and sprinkle with cheese. This was so flavorful - you could taste each ingredient seperately but what a wonderful combination! Highly recommended! Ah, Mexican food. Is there anything better when you want some quick, easy, cheesy, crunchy, spicy goodness? Cook the turkey in a non-stick pan on medium-high heat until cooked through, about 10 minutes. Add the green peppers and onions about halfway through. If the mixture starts to get a little dry or sticks to the pan, add a tablespoon of water. Add at least one tablespoon and as much as three tablespoons of taco seasoning and mix well. Mix the chopped tomatoes, onions, and jalapenos together in a medium-sized bowl. Season with the garlic powder, cumin, salt and pepper, then squeeze 1/2 teaspoon of lemon juice over top. Stir well, and place in the fridge until you are ready to eat. While the turkey is cooking, warm the black beans over medium heat and add another helping of taco seasoning (about a tablespoon). You just need them to be heated through, so they'll be ready in about five minutes. Arrange the tortillas on a baking sheet and brush very lightly with olive oil. Bake for about 5 minutes, until they start to crisp. Remove from the oven and layer the black beans on top of two of the tostadas. 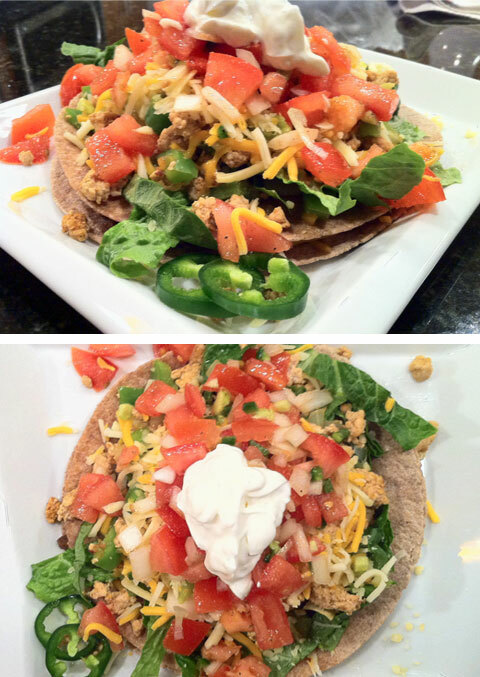 Add a sprinkle of cheese, and then make a "sandwich" and place the other tostada on top. Pop back in the oven for another 3 - 5 minutes, and then remove. Plate each tostada, then add the lettuce, turkey, cheese, and salsa. Top with a spoonful of sour cream. These were SO good and so flavorful. Keith and I both loved it, and it was even sort of healthy. Ole! Well, I have been doing a very good job sticking to my menu planning and cooking dinner every day! I've made the meal I planned to make every day and each has been yum-tastic. What I've NOT been good about is posting the darn recipes! But fear not! I've been taking pictures and just need to get caught up. Last night was freezing and snowy and I'm so glad I had potato & cheese pierogis on the menu. I've eaten pierogis all my life, being Polish, and always loved them. I've NEVER made them or even really thought about making them, until I came across a recipe on another food blog. I cheated a bit by using gyoza, but it was great! In a medium-sized pot, cover the potatoes with lightly salted water and boil until tender, about 15 minutes. Meanwhile, melt the butter in a non-stick pan and then add the onions, sauteeing until golden brown (this will take longer than you think, about 15 minutes). Drain the potatoes and transer to a large bowl. Add salt and pepper, then mash. Add the cheese and the onion butter mixture, and mix well. Taste it, this is your filling and it's GOOD. Take the gyoza and use something round that is very close to the width of the shorter end of the gyoza(cookie cutter, or if like me, you only have cookie cutters in shapes like stars and candy canes, a drinking glass), and cut each gyoza into circles, discarding the extra. HINT: If you are using a drinking glass or other item that isn't very sharp, take about 10 - 12 gyoza at a time and use a knife to "draw" around the edges of the glass. Goes MUCH faster. Once all your gyoza are circular, you're ready to fill! This part is a pain! 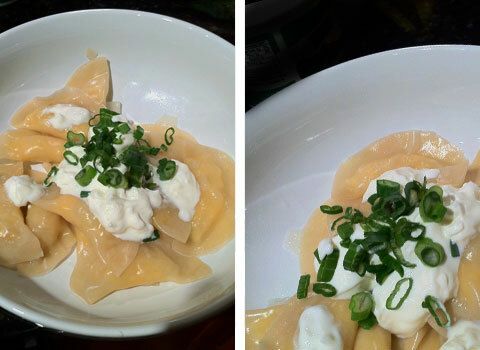 Wet the edges of the gyoza and drop a dollop of filling into the middle, careful not to overstuff. Fold it over and seal well, pressing the edges into each other. If you don't seal them well, they'll fall apart when you cook them and that's very sad. It helps to make the filling sort of like a little log instead of a round scoop. You'll get the hang of it. Fill until you run out of gyoza. Phew! So this will make enough for two people with some leftovers. To cook, bring a pot of salted water to a boil, then add the pierogis one at a time until the surface is covered. You don't want to overfill the pot. They only need to boil for about one to two minutes, max - if you overcook them, they'll fall apart and make a big mess. Fish them out with a slotted spoon and continue cooking until you have about eight a person. Top them with a dollop of sour cream and some green onions, and you've got yourself a delicious Polish treat in less than 45 minutes! You guys are gonna love this. Or at least, I think you'll love it. Or at least, I love it. I'm going to cook dinner every single night this week. How, exactly, am I going to do that? I'm so glad you asked! I'm going to PLAN A MENU! GREAT SCOTT! I sort of did this last week and it worked really well! You didn't see any of the posts because, to be honest, I didn't love any of the recipes I chose. But last week's meals consisted of Dijon Chicken, Swordfish with Healthy Mac & Cheese, Veggie Enchiladas...and...going out to eat. We actually did pretty bad this past week and it was mostly my fault. It's so easy to fall back into the "let's just go grab something" routine, and then when you look at your bank records online and realize you practically spent an entire paycheck "grabbing something" that was neither memorable nor healthy in any way, shape, or form, you sort of want to vomit. Not anymore! I'm planning my meals this week, baby, and it's gonna happen. Saving money, eating better, and, of course, trying out new recipes for all of you. Here's a preview of the week! Yes, I'm a bit too excited for this. I may find this enjoyable. Whatevs. Off to the grocery store! Chocolate + Fruit = L.O.V.E. Ever wanted to make your sweetie something...well, sweet, but didn't want to bust out the flour and sugar and butter and actually BAKE something? Try chocolate covered strawberries! Incredibly easy and actually fun and romantic to make together - tested out last night for all of you just in time for Valentine's Day! Special equipment: a double boiler (or, you can be resourceful and just use two small pots, stacked on top of each other). In the bigger pot, put about 1 inch of water and heat on high until it boils. Place the chocolate chips in the smaller pot and, once the water is boiling, stack it on top and turn the heat to medium. The chips will start melting almost instantly, so stir, stir, stir! 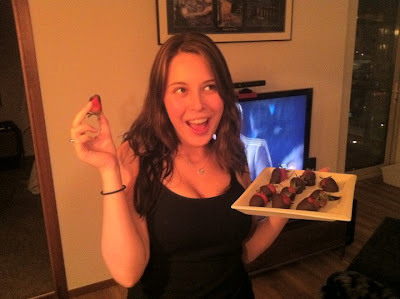 Once the chocolate is perfectly melted (no lumps), dip each strawberry into the chocolate and twist to coat. Lay it on a plate lined with parchment or wax paper (if you don't do this, your chocolate will stick to the plate, but you can scrape it off). Once all your strawberries are chocolated, refrigerate or freeze until the chocolate has hardened (freeze for about 5 minutes). You can get creative with this by melting different kinds of chocolate - white, dark, etc. - and either double dipping or drizzling on top. It's fun and romantic, and man, those things are tasty! After Pilates this morning, it started raining cats and dogs outside. This, of course, was cause for Keith, Bella & me to immediately revert to lazy couch potatoes and watch several hours of old LOST and Grey's Anatomy episodes on NETFLIX. Eventually, I decided I needed to do something, so I went into the kitchen and ended up pulling a bunch of random ingredients to make dinner. We still haven't gone grocery shopping since we returned from our trip on Tuesday, so I made due with what we had in the freezer and pantry. That, coupled with the fact that Monday is Valentine's Day, was enough for me to decide to go ahead and make something that wasn't healthy...exactly. Or, at all. But hey, at least we went to Pilates! 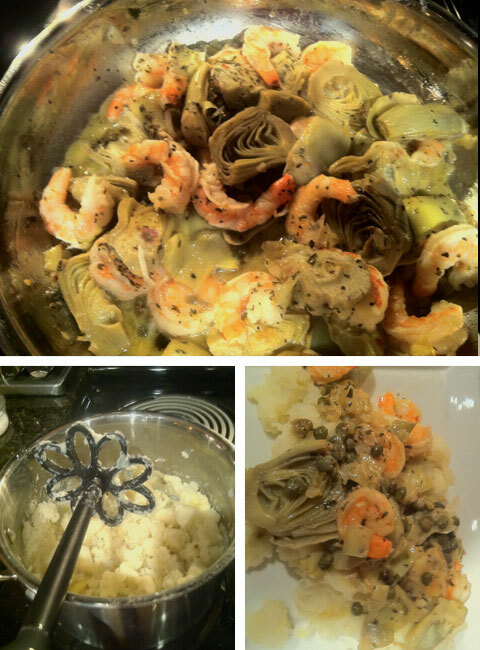 I served this yummy artichoke caper shrimp concotion on a bed of mashed potatoes. To cut down on the fat and calories, I didn't put any butter or milk in the potatoes, but just added a bit of the cooking water while mashing to reach the right consistency. 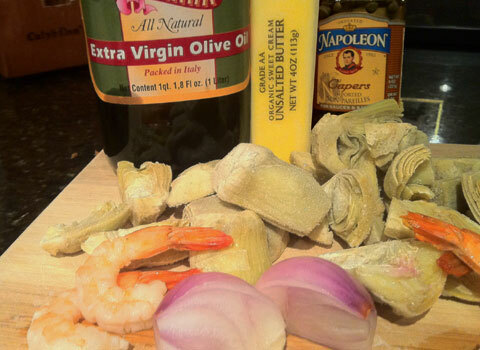 The sauce from the shrimp added plenty of flavor and moisture once added! Heat 1 tablespoon of olive oil in a saute pan on medium-high. Add the shallots and saute until fragrant, about 1 minute. Add the artichoke hearts and saute until they thaw, about 2 - 3 minutes. Sprinkle with Italian seasoning and sea salt, then add 1 tablespoon butter and continue cooking for 2 minutes. Turn the heat to medium, then add the shrimp, capers, remaining Italian seasoning, and remaining butter and saute until heated through and butter melts, about 3 minutes. Serve atop mashed potatoes. Lots of possibilities with this one, guys! P.S. Do I not have the most adorable potato masher in the world? It doesn't work well AT ALL, but it's so cute I can't bear to replace it. 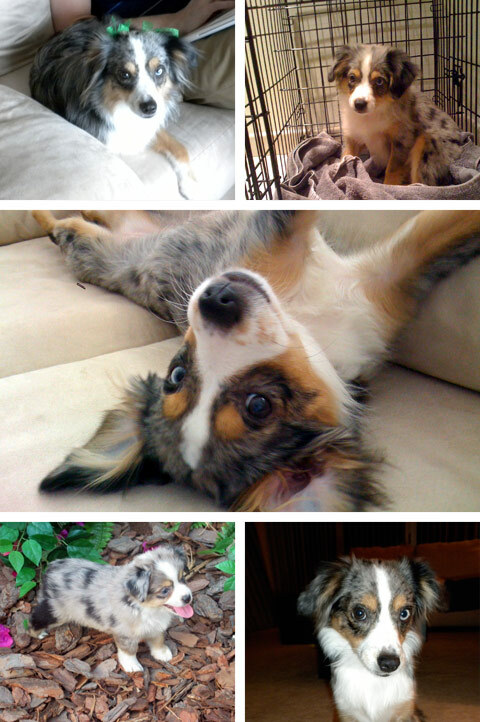 I am a slave to cuteness. Isn't she precious? She's a pain in the you-know-what, but she's cute so she gets away with it. Today's happy is something I'm sure most of my Detroit / MI peeps have seen, but it truly is something special from an advertising perspective. It certainly helps that it's touting my hometown, but anyone can admit this is incredible! In case you missed it, this aired during the SuperBowl and I got a little taste of home while I was in Hawaii. Adding lemon slices to your drinking water can be beneficial for a few reasons, but none of them are very earth-shattering! Better flavor - if you aren't particularly fond of water, and adding lemon slices help you drink more of it, then the benefit is obvious - more hydration! Vitamin C - lemon juice has vitamin C in it, so adding it to your water increases your intake. Weight loss - this one is sort of a stretch, but if you switch out regular soda or fruit juice for lemon water (or ANY water), you'll save a lot of calories. Overall, adding lemon to your water doesn't hurt anything. As long as you are drinking water, keep it up! Take it and see how much you know about your precious salt! This might not be rocket science, but if you are looking for a new quick and easy way to incorporate more veggies into your diet, try roasting them! I found this guide for perfectly roasted veggies on Delish.com. It has some interesting serving suggestions as well, but watch the salt, ya'll!